Uganda has one of the highest urban growth rates in the world. 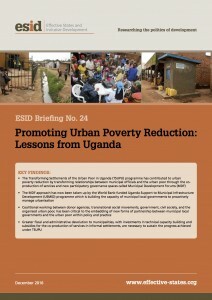 An estimated 60 percent of Uganda’s urban population lives in informal settlements with a lack of access to tenure security, decent housing and basic services. This urban poverty has been reduced through the Transforming Settlements of the Urban Poor (TSUPU) programme. TSUPU has transformed relationships between local-level officials and the urban poor through the co-production of services and new participatory governance spaces called Municipal Development Forums. These new partnerships between local governments and the urban poor have been embedded into policy and practice through coalitional working between donor agencies, transnational social movements, government, civil society and the organised urban poor.